When residents were asked for suggestions to improve the fitness center, their number one response was a dedicated workout space. Now they have one. The new Exercise Equipment Room is furnished with the latest equipment, including dual action machines and a Smith machine, which allows a person to safely lift weights without a spotter. 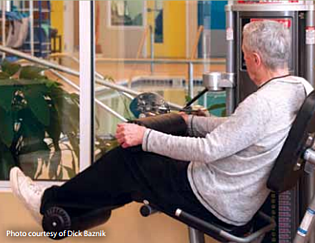 Resident John Leinenweber, an avid participant in swimming and balance classes, said he has now added the Smith machine to his workout. “I’m not much of a machine person, but I’d like to build up my upper body. I’m not a regular yet, I want to become one,” said Leinenweber, who moved to Kendal last year from New Haven, Connecticut. Kendal purchased the equipment based on the recommendations of a resident committee that toured local health clubs looking for safe, easy to use pieces. Before the renovation, limited exercise equipment was crammed into space that was also used for group fitness classes. Now that the equipment has a new home, residents can more comfortably participate in yoga, tap dance and other exercise classes, said Jill Connone, Kendal’s Wellness Coordinator. Plus, residents have talked to Jill about starting some new activities, such as a meditation group. Currently Jill and her staff offer 68 hours of programming weekly. The swimming pool is open 5:30 a.m. to 10:00 p.m. daily, and the equipment and fitness rooms are open around the clock. Personal training, Reiki and CranioSacral therapy are available for a fee.